We deal with a Hamiltonian system with two degrees of freedom, whose Hamiltonian is a 2π-periodic function of time and analytic in a neighborhood of an equilibrium point. It is assumed that the characteristic equation of the system linearized in a neighborhood of the equilibrium point has two different double roots such that their absolute values are equal to unity, i. e., a combinational resonance takes place in this system. We consider the case of general position when the monodromy matrix of the linearized system is not diagonalizable. In this case the equilibrium point is linearly unstable. However, this does not imply its instability in the original nonlinear system. Rigorous conclusions on the stability can be formulated in terms of coefficients of the Hamiltonian normal form. 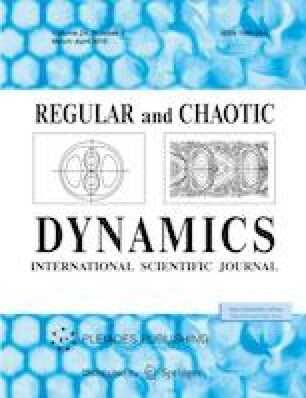 We describe a constructive algorithm for constructing and normalizing the symplectic map generated by the phase flow of the Hamiltonian system considered. We obtain explicit relations between the coefficients of the generating function of the symplectic map and the coefficients of the Hamiltonian normal form. It allows us to formulate conditions of stability and instability in terms of coefficients of the above generating function. The developed algorithm is applied to solve the stability problem for oscillations of a satellite with plate mass geometry, that is, Jz = Jx + Jy, where Jx, Jy, Jz are the principal moments of inertia of the satellite, when the parameter values belong to a boundary of linear stability.